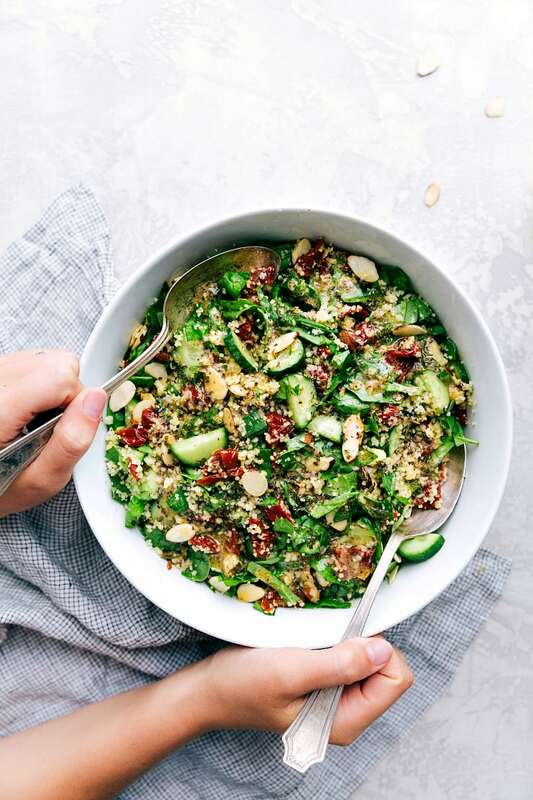 It’s no secret here on the blog that quinoa in a salad is one of my favorite ways to eat a salad (or quinoa for that matter), but this year I’ve mixed it up a bit by using couscous in place of the quinoa and those salads have been equally popular! 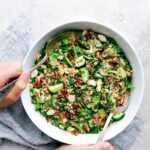 This Greek couscous salad has been one of the most popular salads this year and I’ve had so many requests for more. Apparently I’m not the only one obsessed with a bit hearty salad 🙂 My sister actually tried this salad at my house when I first tested it and she couldn’t stop talking about it. She asked me for the recipe so I took a photo of my notebook with scribbled recipe notes and she re-created it the very next day for a dinner party. After getting dozens of requests for the recipe she called me and said my notebook page needed to be published ASAP! So here it is and *spoiler alert* it is crazy easy to make! So first off, what exactly is couscous? If you aren’t familiar with couscous, it is a tiny ground pasta made from semolina wheat and mixed with water. While most other pastas are mixed with water and eggs and formed into sheets, couscous is made by rubbing semolina between wet hands until tiny pieces are formed. That couscous is then dried and you can later cook it in boiling water! Cool right?! There are also different kinds of couscous — Israeli couscous (still a type of pasta) has granules that are much larger (think the size of a small pearl; that couscous is used in this Italian couscous salad!) For this recipe, we’re using regular couscous. And, how do you make a couscous salad? Start by making the couscous. Couscous takes mere minutes to make! You’ll start by boiling water (1 cup of dry couscous gets boiled in 1 and 1/2 cups water). Once the water is boiling, you’ll add in some salt and oil or butter (if desired). Next you’ll add the couscous to the boiling water, give it a stir, cover the pot with it’s lid, and remove it all entirely from heat. That couscous will steam for 5 minutes and then it will be ready! Once it’s steamed, you can fluff it with a fork and then chill it for the couscous salad. I like throwing it in the fridge while I prepare all the veggies. Last step is the simple dressing! I add everything to a mason jar, shake it to combine, and it’s ready to go! From solely a calorie perspective: One cup of prepared regular couscous has 176 calories and there are about 210 calories in white rice. 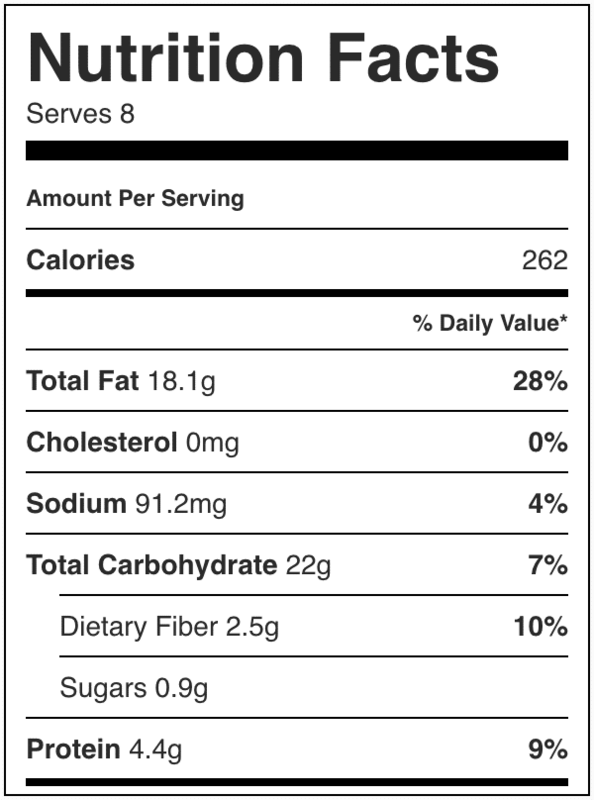 There are 222 calories in one cup of prepared quinoa. Beyond calories, there are many various health benefits for all three options to consider. 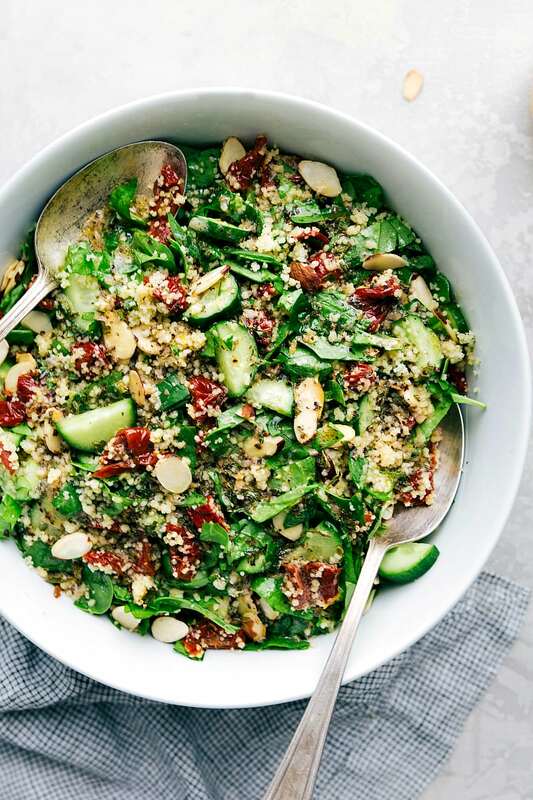 In this couscous salad, you can use regular couscous, whole wheat couscous, or quinoa interchangeably! Prepare the couscous according to package directions. Fluff with a fork and then place in the fridge to cool down. Meanwhile, prepare the veggies: coarsely chop the sundried tomatoes, coin and halve the persian cucumbers, and remove stems then coarsely chop the spinach. Prepare the dressing: add all of the ingredients to a large mason jar. Place on the lid and shake everything to combine. 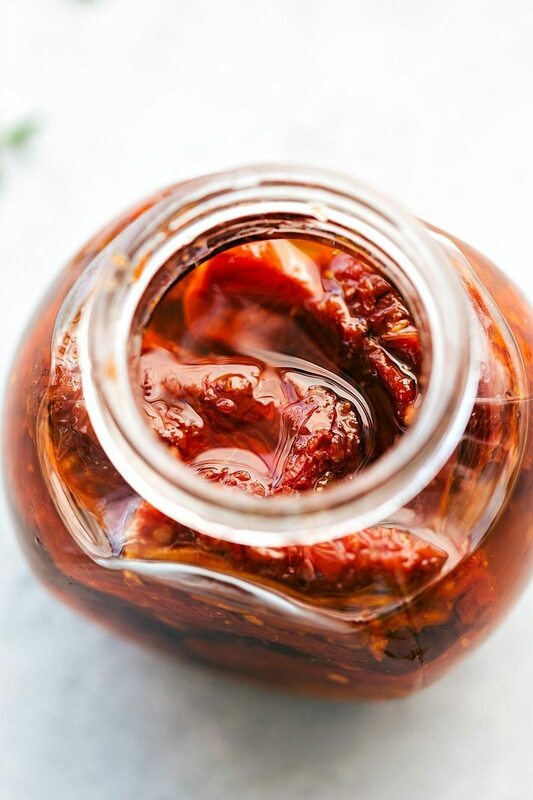 Store in the fridge until ready to serve. To serve: add the cooled couscous to a large bowl. Add in the tomatoes, cucumbers, spinach, and toasted almonds. Gently toss everything to combine. Add the dressing (to desired preference) and toss to coat everything. If desired, add feta cheese. Serve immediately! If you aren't eating this salad all in one event/sitting and want leftovers, only add almonds and dressing to what will be eaten. 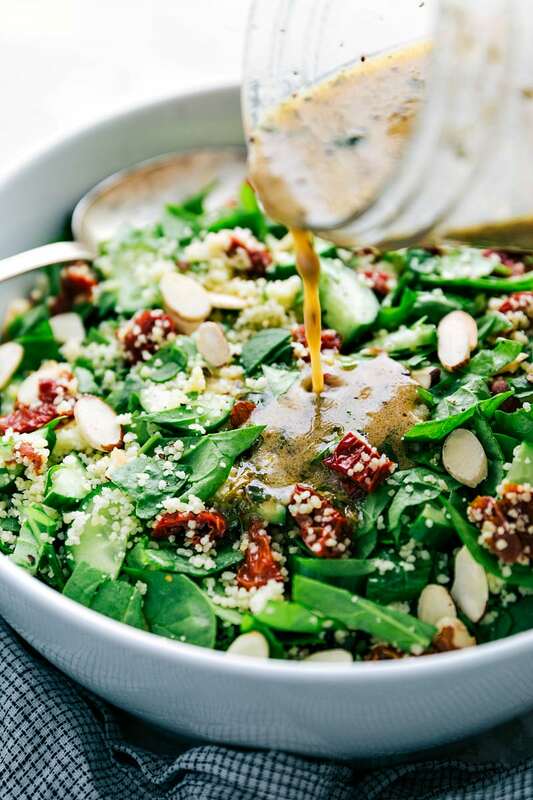 This salad doesn't sit well with the dressing or almonds.